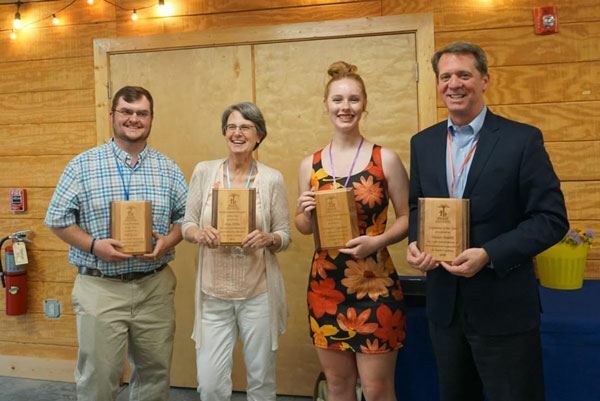 Every year, EEASC recognizes those who make a difference in supporting environmental education in South Carolina. Congratulations to the 2018 Annual Award Winners! Rachel Enggasser is a rising high school senior who has established herself as a role model for environmental literacy at the local, state, and national level. She attended EEASC summer conferences as a young child, became a 4H Jr. Naturalist at age 10, refined her skills through middle school by participating in environmental “Citizen Science” initiatives and volunteering at Roper Mountain Science Center, and went on to help start and promote the Adopt-a-Stream initiative in South Carolina. By the time Rachel reached high school, she had the experience and knowledge to start-up and coordinate environmental grant projects, becoming an example for other students. Within the last year, she has been named Georgia Adopt-A-Stream’s ‘Beyond Borders Award’ winner, received the national 2017 EPA President’s Environmental Youth Award, was runner-up in the 2017 international EcoHero competition, and is now providing services as a part-time intern at an upstate environmental law firm (all while still in high school!). As Education Coordinator for Sonoco Recycling, Director of the SC Green Steps Schools initiative, and a long-serving member of the Environmental Education Association of SC, Jane Hiller is a keystone member of the environmental education community in SC. Hiller’s leadership, creativity, and encouragement have inspired countless teachers, colleagues, and members of the public to become better stewards of the earth. Formerly a classroom teacher, Hiller understands the unique challenges teachers face as they seek to “green” their school communities, and she uses this knowledge to provide simple and appropriate resources to help their projects succeed. She also equips and encourages her fellow environmental educators by hosting networking events and workshops in her education room, coordinating newsletters and other communications tools, and creating opportunities for her partners to share their messages such as Earth Day at Soda City and monthly Green Messaging tables downtown. This year, Hiller has made a concerted effort to address the issue of diversity in environmental education and has pursued many opportunities to reach out to underrepresented communities to share information. Examples include setting up displays at various Black History Month events in the Midlands area. Additionally, she has coordinated sessions, as well as participated in workshops, in which this topic has been addressed. This has been testament to her desire to bridge the gaps and help educate as many communities as possible. Hiller is an educator, an environmentalist, a community builder, a leader, a mentor, a creator, and a friend. EEASC is lucky to have such an earth-warrior in its ranks! Rawl school grant partnerships make it possible for schools to establish and to expand plant-based environmental opportunities for students. They select and fund dynamic, innovative learning opportunities in schools to build or sustain school gardens. Rawl grants have enabled Meadow Glen Elementary to establish and sustain multiple outdoor classrooms, used to extend students environmental experiences across multiple grade levels. They are also committed to employing sustainable practices and processes: Farming, Processing, Fertilizer Reduction of 25%, Irrigation Efficiency Increased by 25%, Cover Crops, Wind Strips and Field Borders. James Smith, who's currently running for Governor, has a history of standing up for the environment. He was first elected to the South Carolina House representing the 72nd district in 1996, where he still currently serves. Over his time as a legislator, he has earned a 97% lifetime score from Conservation Voters of South Carolina. Additionally, The SC chapter of the Sierra Club has endorsed James Smith in the governor's race, noting his support for renewable energy and opposition to offshore drilling.